I'm sure you've heard of it. Maus is the story of a Jewish survivor, Vladek, in Hitler's Poland as told by Vladek's son, Art, a cartoonist. The complete Maus won the Pulitzer Prize Special Award in 1992. The structure of the novel weaves together two storylines: that of the modern day life that Vladek and Art experience and that of Jews living in WWII Nazi regime. This narrative framework is remarkable, as it places the reader inside of a unique story line; we learn of the narrator's father's tale of survival as he recounts it to his son, who takes notes for the book he is writing. The product is a heartbreaking and captivating graphic memoir in which the Jews are portrayed as mice, and the Nazis as cats. I read this book in one sitting, which isn't a feat considering it's a 160 page graphic novel. Regardless, I didn't want to put it down and I'm upset I didn't just go ahead and buy Maus II along with the first. Those tricky publishers should have released them as one novel in the first place. But I digress, what makes this such a memorable novel that it's not only about WWII, it's also about history itself; how it's told, how it's remembered and how it effects generations to come. It also examines the complicated nature of families and the uniqueness of father/son relationships; the generational differences that ultimately cause tension and the difficulties of understanding one another. 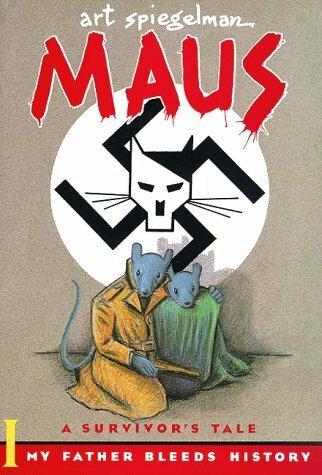 Maus has been critiqued for portraying such a horrific and monstrous period in history in a unsympathetic medium, therefore downplaying the enormity of the Nazi regeme. However, I would argue that instead of belittling the subject matter, it actually portrays it in a haunting manner, expressing ideas and emotions that sometimes only pictures and illustrations can evoke. Since Maus I ends quite abruptly, I plan on reading Maus II very soon. I love discussing this one with my college students and really digging into the way we process images and visual symbolism. Awesome, awesome read. This was my first graphic novel and a life-changer and reading-changer for me in a number of ways. This was my first graphic novel as well. I agree that the presentation was incredibly haunting, and did not belittle or minimize the Holocaust at all (at least to me). There are panels from both volume that still stick with me years after first reading this. I have been meaning to read this for years. You've given me a kick to do it - thanks! I love this one. I actually loved Maus II even more, but I read them back-to-back so they did feel like one book to me. I hope you get your hands on a copy soon. I'm not generally a fan of graphic novels, but I've heard so much about this one that I'm tempted to get a copy soon. Certainly an interesting perspective and I'm always fascinated by the ways in which stories are passed on. Unrelated: I almost purchased a copy of The Unnamed at the used book store during my travels, but decided against it to save. I'm interested to see what you think. I couldn't agree with you more! I loved this book. I agree with your general point, but I have to disagree with this phrasing: unsympathetic medium. It's not the medium that's unsympathetic, but rather readers who do not appreciate the medium for what it is. Even if you don't like a certain type of art, it's hard to call it a bad medium. Personally, I found Maus to be as haunting and curious a Holocaust tale as almost any other. The different medium changed the experience, yes, but much in the way viewing photos might have. Or paintings. At the end of the day, it's all art, right?